"Hanging Bridge Of Tamparuli Sabah"
It good to live in a town like Tamparuli, where you can see the lovely people, Tamu Tamparuli and especially our "Hanging bridge" or the local call it " Jambatan Gantung Tamparuli". If you talk about "Jambatan Gantung" many people in Sabah will point it to Tamparuli where there is a song title as "Jambatan Tamparuli" dedicate to "Jambatan Gantung Tamparuli". Do not forget to take a picture for your collection at Tamparuli Hanging Bridge if you visit Tamparuli soon. Sabah is rich with special kind of thing, one of it is the hanging bridge. 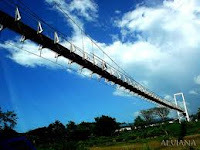 If you travel around Sabah, you can see a lot of this hanging bridge in every major city and especially in rural area. Some part in Sabah such as Lahad Datu, Semporna, Kunak and Tawau is the major town in Sabah that you cannot find this "Hanging Bridge" expect at Sepilok Park. If you compare Sabah with Peninsular of Malaysia there is no such thing as hanging bridge and if the Malay travel in Sabah they are really fascinated with this bridge. Clip Video... Click Here " Jambatan Tamparuli "